Now that the Obama administration believes it has the evidence that Syrian government forces used chemical weapons, options are being reviewed for U.S. military strikes against Syria. All indications are this will not be a NATO-sanctioned effort, as the 1995 bombing campaign in the Balkans, but an initiative by a coalition of willing allies, largely composed of NATO members such as the U.S., Britain, France and possibly Turkey. This NATO-lite effort comes at a time of waning support for the multilateral security organization, especially in Western Europe. Since 2009 NATO favorability is down 14 percentage points in Spain (to 42%) and Germany (to 59%) and 13 points in France (to 58%), according to a Pew Research Center survey done before the most recent allegations of chemical weapons use by the Syrian government. (This data was not included in previous Pew Research reports). 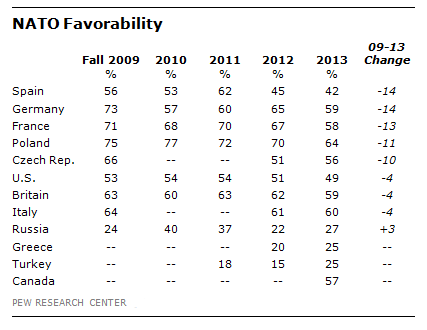 Only about half of Americans (49%) see NATO in a favorable light, virtually unchanged from 53% in 2009. Although Turkey is a long-time NATO member, Turkish public support for the security alliance is quite weak. Just 25% of Turks have a favorable view of NATO today, although that is a 10 percentage point improvement over NATO backing just a year ago. How a U.S.-led military strike against Syria involving multiple NATO allies might affect such views is unknown. But in a March 2013 survey, just 22% of Turks supported Western countries sending arms and military supplies to the anti-government groups in Syria.